I learnt this meal from my roomie and a great friend, Marie. I LOVE IT! It's very simple and the taste is just fantastic! 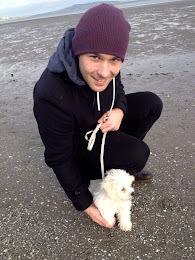 One of Marie's friend from Holland came to visit us to Dublin and I didn't know what to cook. I must say, I was nervous a bit, because he is a cook himself and he loves nice food. So you can imagine...Well, pasta della masaia was the only thing I could think of. 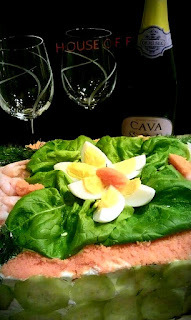 It's fancy, it's simple and it's delicious! Well, he loved it. So, if you like pasta, tomatoes, chicken and lots of garlic, go for it! I wanted to cook something nice and not too complicated this evening. I remembered, that Jamie Oliver once baked chicken with garlic and lemon zest under the chicken's skin. I thought that would be perfect, because my partner doesn't eat the skin anyway and all the delicious taste is usually right there, in the fat part we all love so much:) well, almost all of us! So I grated a bit of lemon zest, mixed it with garlic, salt, tarragon and pressed the mixture under the skin. Then I baked it in the oven, as a side dish I served boiled broccoli, fine beans and baby potatoes. I also made some gravy from the chicken juice, onion, soy sauce and tarragon! I learnt this fantastic Indian snack from my colleagues! I must admit, that making them takes a lot of time, in my opinion, but once you get the grip and practice a bit, you will be a samosa master in no time! Don't forget to serve them with a nice dip, that's a guaranteed win! You can have a look at one recipe here. When I started with my healthy life style I had to learn how to cook without mixing carbohydrates and proteins. One evening I got in the mood for stuffed pepper, but I couldn't use the usual ingedients, such as minced meat, eggs, flour or rice etc. the way I liked it:) so I only used minced meat, mushrooms, sweet corn, horse radish and stuffed the pepper with it! I baked it in the oven with a little bit of water and it was yammy! I found these delicious tartlets in one amazing cooking book and baked several times. I loved them so much that I made them with my sister for our New Year's party and they disappeared from the table in a few minutes:) Lovely taste of feta cheese, nutmeg, spinach and pine nuts will make your taste buds go crazy! Ooooh, I will probably never stop loving this soup, if any of you like spicy food and haven't tasted this one yet, you should definetely do so. Fantastic taste of red curry, coconut milk and lemon grass will make your lunch interesting and exotic! Stefan’s favorite seafood cake! He never loved sweet cakes very much so I promised him that I would make Smörgåstårta for his birthday. 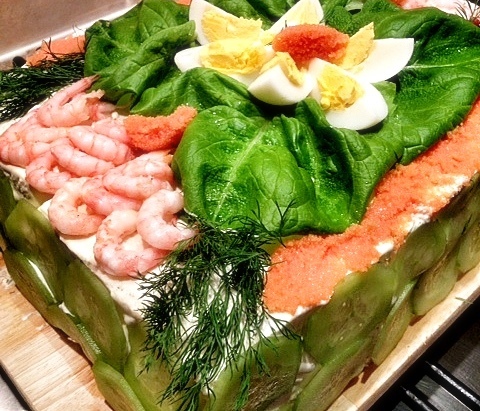 Smörgåstårta is a savory sandwich cake that you can make out of anything you like! I try to prepare it every year either for his birthday or when there is a Swedish event or a celebration. My usual ingredients for this “cake” are prawns, crab sticks, egg mayo, dill, crème fraiche, red onion and white toast bread. The decoration is then different every single time! There are so many different recipes of Smörgåstårta! I have found a couple of nice ones here ! My friend Kelly was turning .. :) so me and my ex-roomie Lucia from Rumania decided to bake a birthday cake, it was fun to cook with Lucci and after a couple of hours we managed to create this vanilla cake with strawberries & blueberries! I wanted to surprise my roomies with something a little bit different so I went for chicken skewer and traditional potato pancakes! This dinner took some time to make but their satisfaction was worth the price. Grate the potatoes, place them in a grater or tea towel and press them to take out the water. Place the potatoes in a bowl, add in the garlic, egg, salt and pepper, marjoram and mix it all together. Gradually mix in the flour. Pour part of the mixture with a ladle onto a hot and well-oiled frying pan. Fry each side of the pancake for at least 5 minutes or until golden brown. Drain on kitchen paper and serve immediately. You can serve the potato pancakes with sour kraut and ham or chicken with vegetables and tomato sauce. I made simple skewers: chicken breasts, onion, pepper and carrot. I baked it in the oven for 35 minutes. This was funny, I followed the recipe and did everything I was supposed to, but something went wrong. When I wanted to fry them, they all disappeared in oil:) so I baked them in the oven. Well, they were low-fat at least! I decided to make this healthy starter when we had visitors from Sweden and as everybody knows, the swedish are generally very healthy people, so I thought it was a very appropriate decision. Very simple chickpeas humus with raw vegetables! Hi everybody, I will start uploading photos of meals I've cooked and I would be really happy if any of you could comment on them, I look forward to your respond. Thank you.